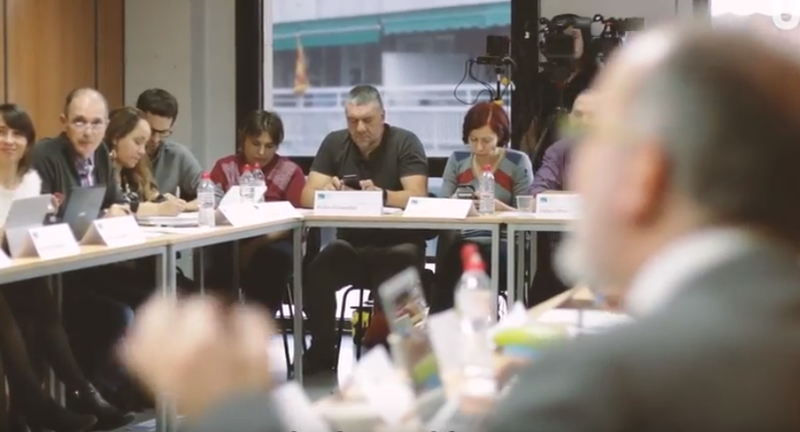 On November 12, the international seminar organized by the UNESCO Chair in Education and Technology for Social Change entitled “Aprendizaje a lo largo de la vida: ¿Cómo aprende nuestra sociedad?” took place, held at the Col·legi d’Agents Comercials of Barcelona. The objective of the seminar was to discuss the new forms of learning throughout the life of today’s society, with special attention to the constant changes that citizens have to face in in their daily lives and the role of technology in these new ways of learning. The seminar began with several presentations made by experts in the field. The first one was carried out by professor Lisa Blaschke of the Carl von Ossietzky Universität Oldenburg of Germany, who presented the concept of heutagogy, a concept that helps to understand how adults gain the capacity of autonomous learning throughout life. The other presentation was made by professor Dave Cormier of the University of Prince Edward Island of Canada, who described rhizomatic learning, a concept that is used as a metaphor for the educational development of people. After the main speakers concluded their presentations, the director of the UNESCO Chair in Education and Technology for Social Change of the UOC, and member of Edul@b, Albert Sangrà made a presentation on learning ecologies as a framework for analysis and investigation of the learning throughout the life of people. According to the concept of learning ecologies, citizens learn in many ways throughout life, mixing formal, non-formal and informal activities, in face-to-face, mixed or online environments. Its study allows to know the mechanisms of development and professional updating of different types of people and professionals. The seminar continued with a session entirely dedicated to the concept of learning ecologies. In the first part of the session, Dr. Mercedes González Sanmamed from the University of La Coruña presented the preliminary results of the i+d project “Cómo aprenden los mejores docentes universitarios en la era digital: Impacto de las ecologías de aprendizaje en la calidad de la enseñanza“, a project that also has the participation of Edul@b. In the second part of the session there was a round table in which other projects that are currently developing the concept of learning ecologies were presented, including the thesis project of PhD student Carles Bruguera, which aims to explore the contribution of social media in the learning ecologies of digital communicators in order to identify the opportunities that these media can generate for the permanent updating of professionals in the communication sector.